Whether it's laugh out loud humour, inspiration, thought-provoking anecdotes and perspective; be it taking on fearsome challenges or facing down a torturer and murderer, Rob Hamill's presentations has it all. "An extraordinary mental and physical effort -- something very, very special" is how Sir Peter Blake described Rob Hamill and the late Phil Stubbs' incredible achievement in winning the inaugural Atlantic Rowing Race. 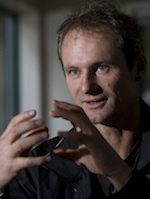 Olympian and marathon rowing champion Rob Hamill has been an International rowing representative for 16 years. Rob's numerous rowing achievements include World Champs silver, Commonwealth gold and a world record on the indoor rowing machine. Rob authored 'The Naked Rower' on how he and Phil Stubbs captured headlines around the world winning the gruelling and inaugural Atlantic Rowing Race in 41 days. He then led teams to successful defences in the next two editions making it a 3-peat of victories. Powerful inspiring messages on tenacity, hope, love and the last human freedom: the power to choose your attitude and how you respond in any given situation. The humour, the insights and the emotional turning points have audiences spellbound. Rob will inspire you to pursue your dreams whatever they may be, to take on new challenges, overcoming hardship against the odds and know that with passion anything is possible! It doesn't hurt to be just a little bit crazy too! To conclude: Rob's life is about following the dream, decision making, calculated risk taking, working together, goal setting, tenacity, positive thinking and, of course, winning!